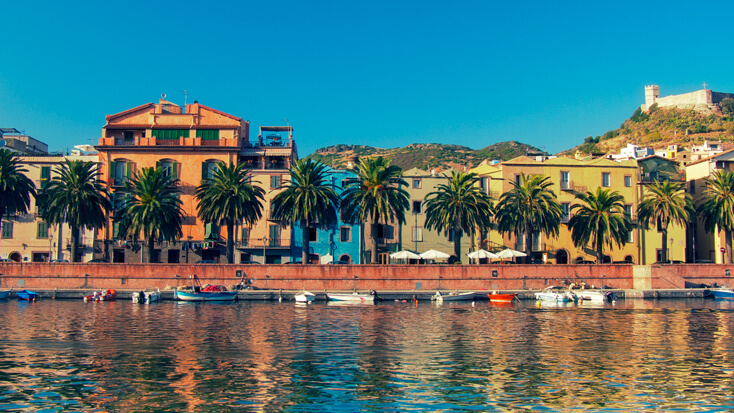 Search for the best flight prices from Manchester to Alghero. Compare prices, book today and save money with Manchester Airport. With an incredible history that dates back thousands of years to the Bronze Age and the roots of humanity, Alghero is a city steeped in antiquity. Whether you’re exploring the ancient settlement of Nuraghe Palmavera or the natural caves of Neptune’s Grotto that have mystified men and women for centuries, you can feel the footsteps of the thousands that have gone before you as make your unique mark on this jewel of the Sardinia. Alghero also has a gothic medieval tradition with several landmarks, including the Bastioni Marco Polo Sea Walls and the Campanile Bell Tower, borrowing from the iconic architectural movement. The mild climate maintains a constant warmth with lows of 17°C (in January) and highs of 30°C (in July and August), making it a great summer getaway or even a welcomed winter warmer. Alghero has a fantastic range of hotels catering to the needs of any visitor. If you’re looking to indulge in ultimate luxury then the Sa Cheya Relais is a must. Nestled in the rugged Sardinian mountains, Sa Cheya Relais boasts incredible views of the rustic landscape as well as many modern conveniences. Alternatively, you could stay at the iconic beachfront Villa Las Tronas which is based on a private promontory overlooking the breath-taking Mediterranean Ocean. And if you fancy a more intimate, romantic stay in the heart of the city, we recommend the Hotel Domomea which is famed for its intoxicating ambience. While you’re less likely to find your favourite high-street brands on the streets of Alghero, there is an amazing local shopping scene with many world-renowned artisans and craftsmen marketing their goods. The central market features lots of fresh produce, perfect for putting together a picnic to take to the beach, and the historic centre of the city plays host to many boutiques, including the leather-maker Calzoleria Naitana and high-fashion tailor Boutique Marras. As you’d expect from any Italian destination, Alghero and its citizens have a passion for food. If you’re a pasta-lover then the first stop on any visit to Alghero should be the Fantasia Della Pasta Fresca which supplies local restaurants with fresh, hand-made pasta. The Fantasia Della Pasta Fresca’s house speciality, rich Sardinian gnocchi, is a must-try. The perfect follow up to the Fantasia Della Pasta Fresca, the Casa Del Formaggio is a world-famous cheese stall that specialises in artisan produce and rare cheeses. If you’ve got a sweet tooth, you can also enjoy the Dolce Pan Bacco di Marongiu Emanuela bakery which is known for selling an incredible selection of pastries, artisan breads and homemade chocolates. Combining the traditions of an ancient fishing community with the feasts of Christianity, Alghero plays host to several major festivals which are sure to be the highlight of your holiday. The 15th of August is Ferragosto, or the Feast of Assumption, and a public holiday across Italy. Normally celebrated with fireworks and a procession of people carrying the statue of Mary through the town centre, this is a true summer festival with lots of music and performances to enjoy. One of the Alghero’s more unique holidays, Sagra del Bogamari sees locals celebrate the Sea Urchin. A food festival featuring Sea Urchin recipes, many restaurants offer a special Sea Urchin menu for the occasion and there are even Sea Urchin decorations found around the city. Sagra del Bogamari takes place at some point between March and May, depending on several factors including the availability and maturity of local Sea Urchins. Held in the run-up to Lent, Carnevale is when Alghero go wild as the streets are filled with parties, music and dancing. If you visit during this time you can expect incredible live performances and memories that will last a lifetime.